This week, the Weekly Photo Challenge is journey. 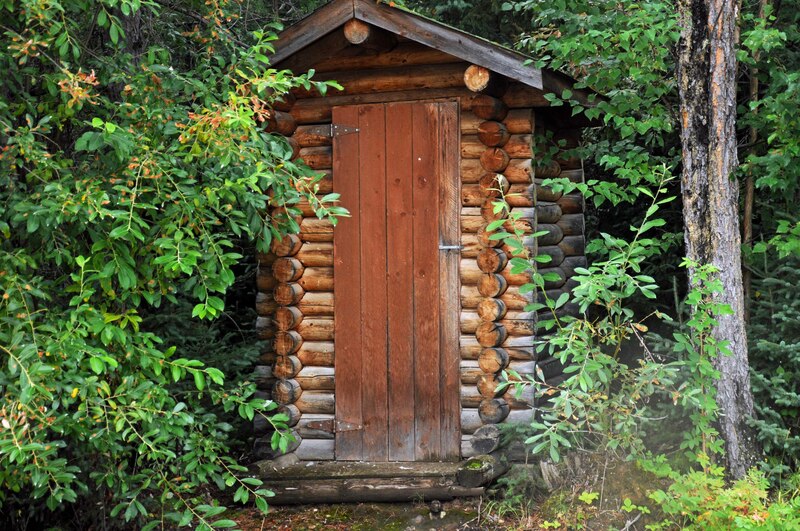 I would like to take you on a journey… a journey to find the ultimate outhouse. This is an essential search when travelling to the northern parts of Canada, where towns are few and far between. 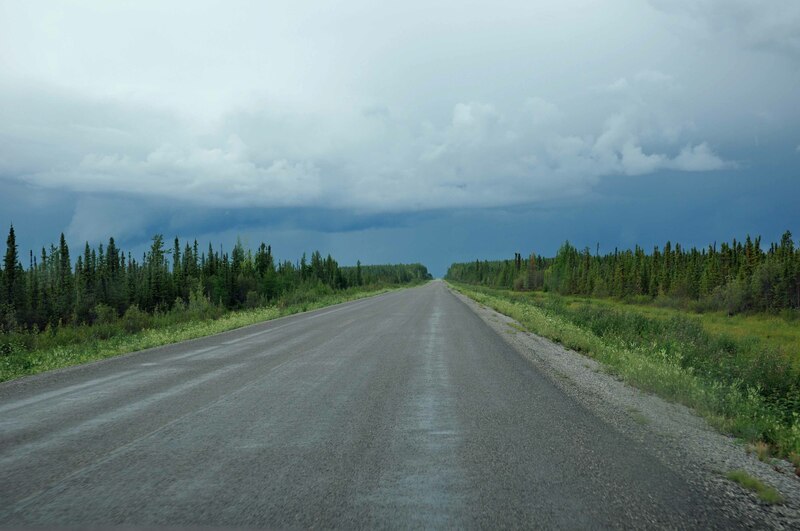 the endless highway... on and on and on.... not an outhouse in sight. 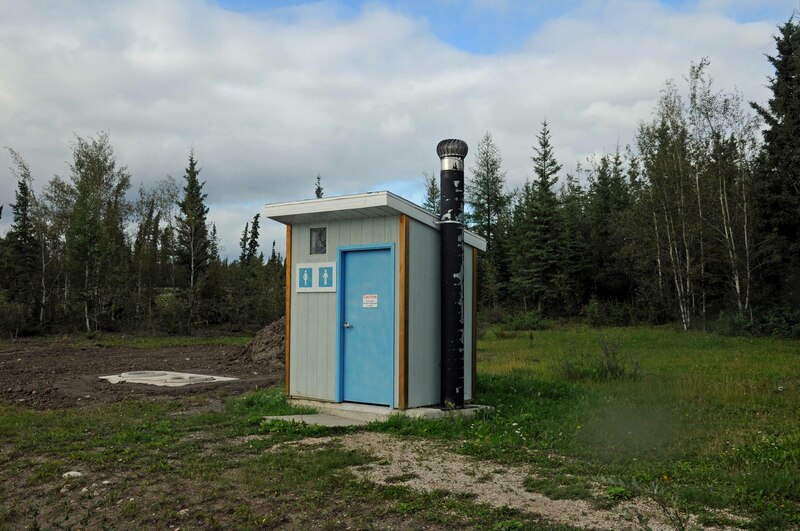 Sometimes the outhouse is out in the middle of a field with a small parking lot and nothing else around. 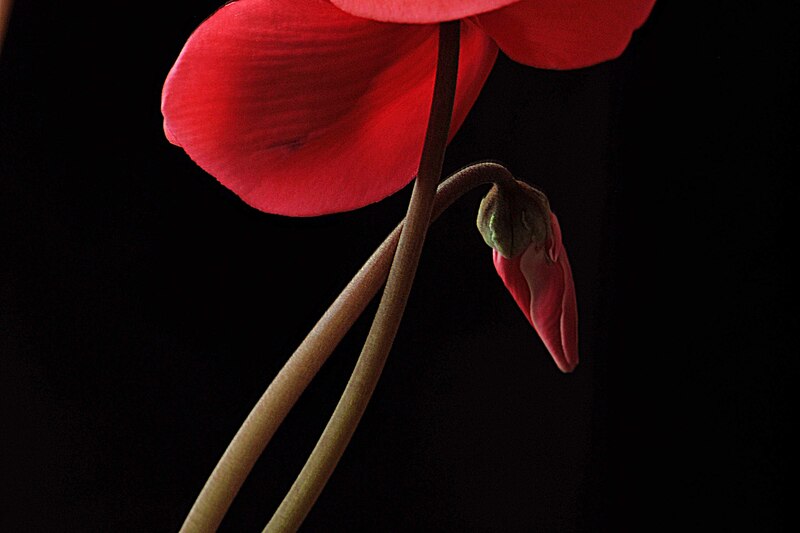 It seems all exposed and alone. I wondered about the sign on the door. WHAT?? Really? At what age can we leave them? 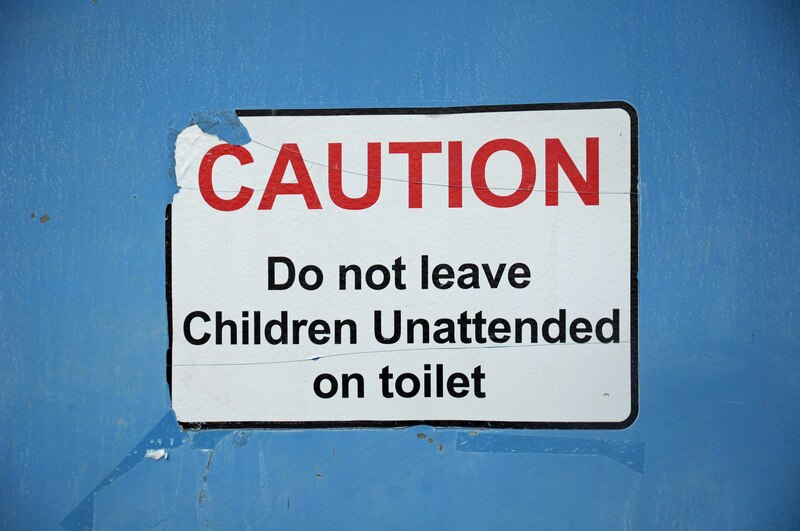 Do people tend to drive off leaving a child in the outhouse? This cute little blue one was on a bit of a tilt. The bushes are growing around it. The door was left open. Is it safe? I was a little skeptical. Is this safe to use? Maybe in a pinch. How desperate am I? Some are doubles, Men on one side, Ladies on the other. 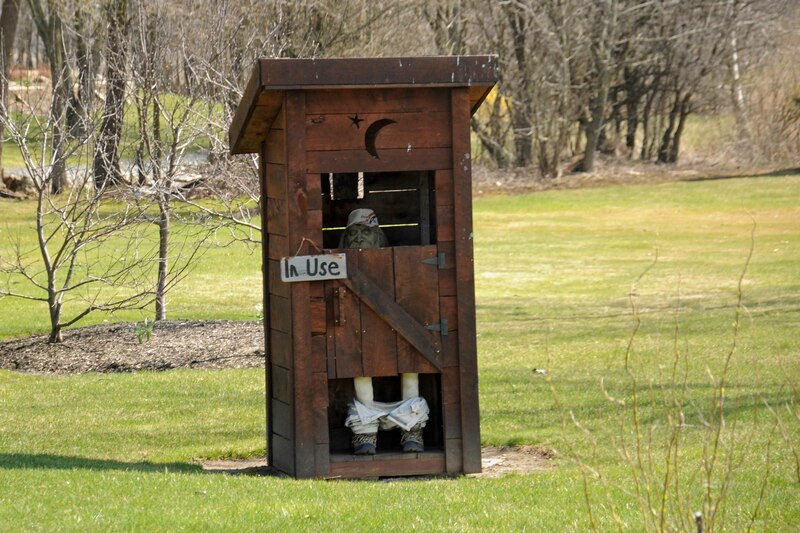 Is this an outhouse or and in-house? I suppose it was much preferred over going outside in the middle of a dark and cold night, but I would hate it in the morning. I am glad I am living in the era of indoor plumbing. 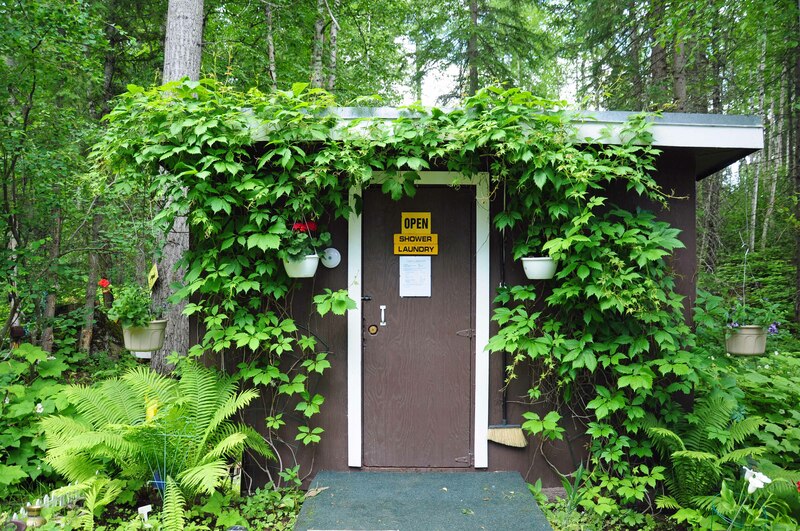 Some Outhouses are super fancy, dressed up with plants and flowers, covered in vines. A treat for the weary and desperate traveler. 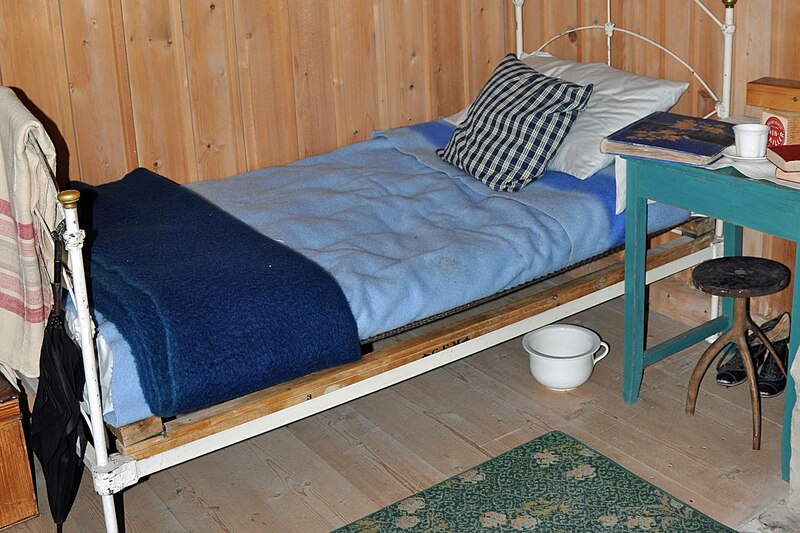 wonderful.. this outhouse is complete with flush toilets, a shower, laundry and books, if you are planning a longer visit. 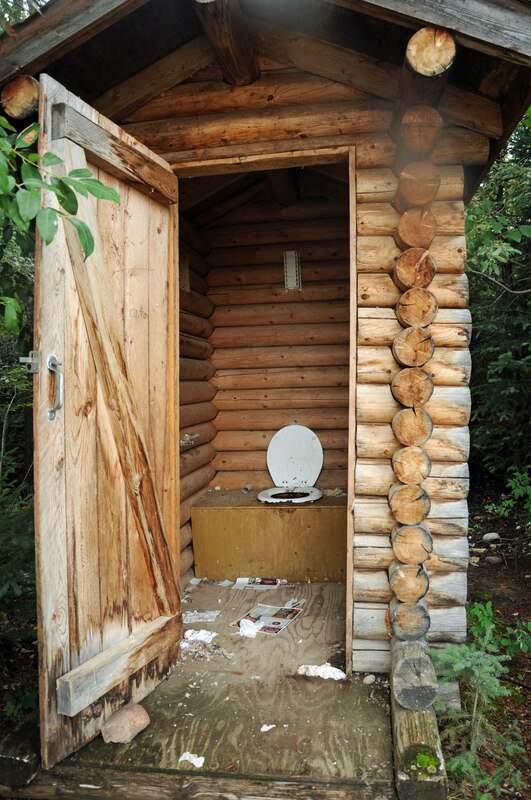 Sometimes, there is a conveniently placed outhouse, but one has to wait for a turn. I waited and waited and waited and waited. He looks a bit constipated... I wish he would hurry up. After a long drive, searching for a sign, desperate for a rest stop, I was ready to give up and find a conveniently located bush when “what to my wondering eyes should appear”, but a cute little log outhouse nestled in the bush. I was so excited and about to be relieved. It was time to find that bush. A little way down the road.. I was caught. I hope you enjoyed the journey. 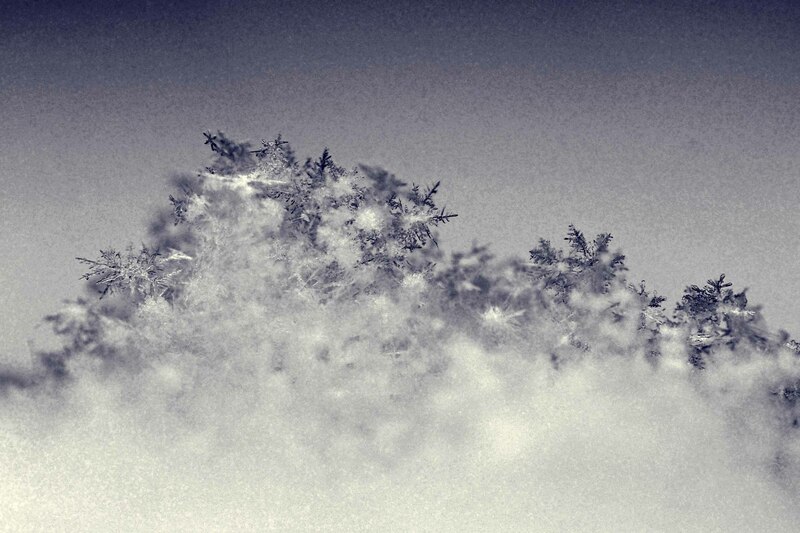 If you plan a trip to the far north, I can tell you that I have become an expert in finding relief behind a bush. This entry was posted in life, Photography, Travel, Uncategorized, Weekly Photo Challenge and tagged humor, humour, Journey, life, nature, Outhouse, Photograph, Photography, travel, Travel and Tourism, Weekly Photo Challenge. Bookmark the permalink. Always good to know! lol Too bad that little log one wasn’t as nice inside as out. I was ready to move in, until you opened the door! 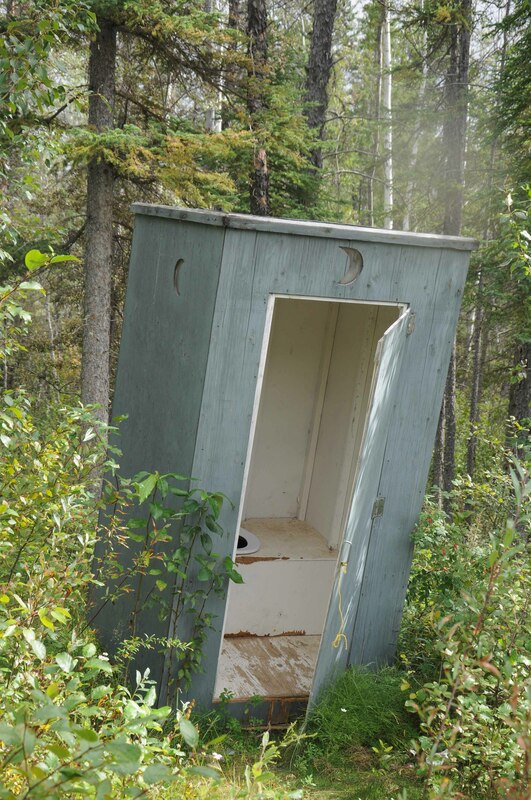 I know, I was totally thrilled to find a great outhouse… until Thanks for dropping by…. LOL! Great post. I’ve become very good at finding relief behind a bush, too. Sometimes outhouses are such a rarity there’s little choice. I love your take on the theme! Very funny montage…excellent photos if an unusual subject matter. I find a shovel works well !!!! That sign about the children is funny. Personally, I rather go in the bush. Those outhouses can be nasty. The best one I’ve been to was a really nice composting one on the Assiniboine Trail in Banff. The worst? – at the bottom of the Gros Morne Mountail trail in Newfoundland. Most unique post, certainly interesting, funny, ewww, amuzing, and unusual. I have to say, that this is “exceptional” post which I have seen. Great. Those were really funny but I have a hard time using them nonetheless. We have a two-seater and if you had seen as many flashlights chucked down the hole as I have, you’d understand the adjuration to monitor children! I once caught an older child dangling a younger child upside down into the hole to retrieve a toy sword…. You should get the Frank Lloyd Wright Photo Essay Award. Interesting journey! You must be an expert on outside ‘loo’s’ by now! A fun and exciting journey. I did enjoy the ride. Thank you. Perhaps one day, I may also need to use the “bush” if emergency strike. Hopefully not. Thanks for the post. Hilarious Maggie! I would prefer a bush to most of those but one thing to remember in those cases is that a long full skirt is very useful to hide under! That was so entertaining and funny! A litlle grose but still funny! This is a great post. You really made me laugh with this one. Well done. A great entry. I love the sense of humour. 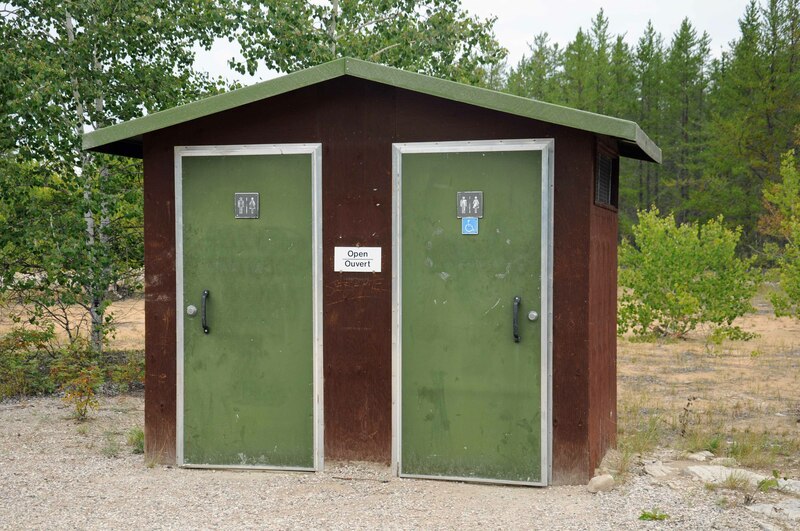 We have been very impressed by the outhouses here in British Columbia. The National Parks/Regional Parks are very good at providing the necessary relief assistance. Thank you for the journey. I grew up in a community where I was a part of three sets of grandparents installing indoor plumbing for the first time in their lives. 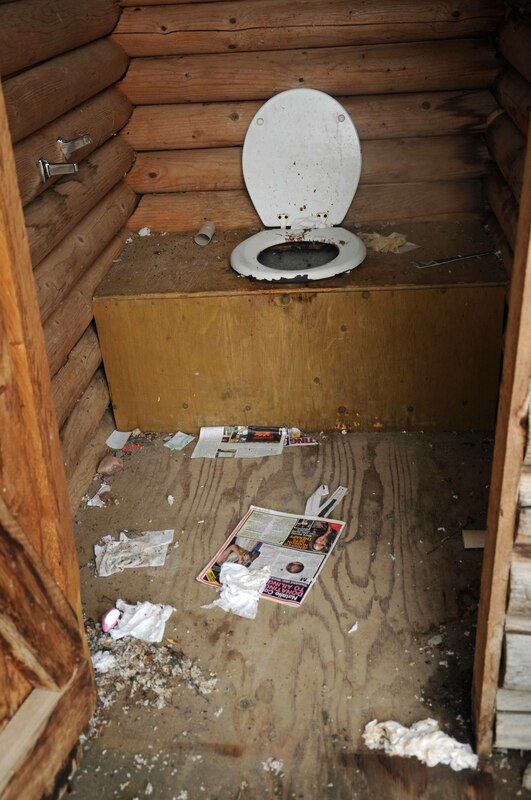 I don’t have many memories of being in the outhouse. Perhaps I have blocked them all out. I was actually talking to my boss this very day abou wanting to take the trip from the eastern side of Canada over to the western side. It grew out of trip I made a couple of years ago and snowed in at a place called the Mohawk Inn. I was talking to one of the locals in the lounge that night and he was talking about the trip across what almost literally the top of the world. Being from a country setting myself, I found it very appealing. OH MY! What a journey. I’m glad it ended in you beimg RELEAVED. This is hilarious! But, I feel your pain when it comes to taking a long trip in the car and trying to find a restroom (outhouse) when you need one.